Hey guys! I hope you’re having a fantastic weekend! I got back from a short trip to Seattle a couple of days ago, but wanted to hop right back on the meal prep wagon ASAP. I didn’t have a lot of time to brainstorm a new recipe combo, so I turned to an old classic, and something that I’ve been craving the past few days—Maple Dijon Chicken Thighs. 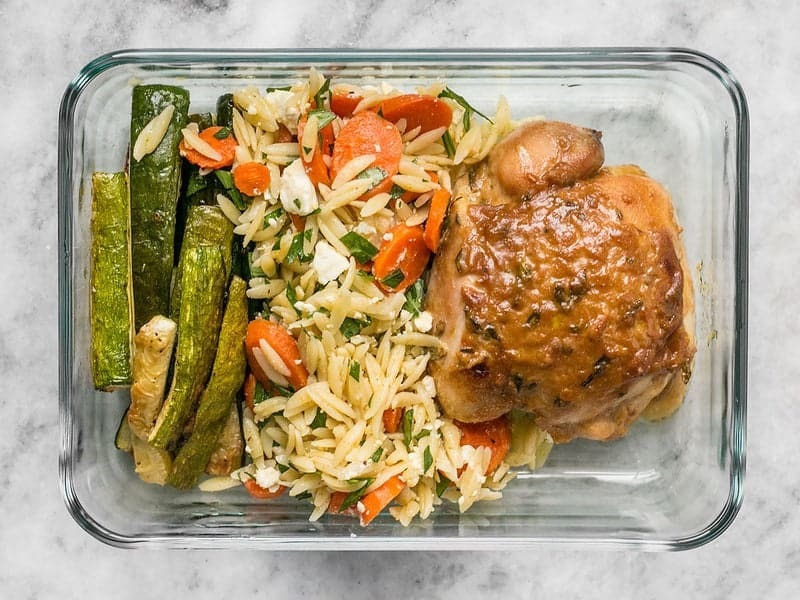 I paired the sweet and tangy thighs with the same side dish as the first time I made this recipe, Carrot and Orzo Salad, and then added in some roasted zucchini for more green. Roasted zucchini certainly isn’t the prettiest food in the world, but I love the creaminess that zucchini takes on when roasted. I kept the zucchini simple with just some salt and pepper because there’s already a lot of flavor going on with the Maple Dijon Chicken Thighs. All three of the items in this meal prep use the oven to roast, so let me give you an idea of how I timed it all. I began with the carrots and got those in the oven, then began on the zucchini. Once those were in the oven (on the lower rack), I started boiling water for the orzo for the carrot and orzo salad. While the orzo was boiling and the vegetables still roasting, I prepared the maple dijon chicken. 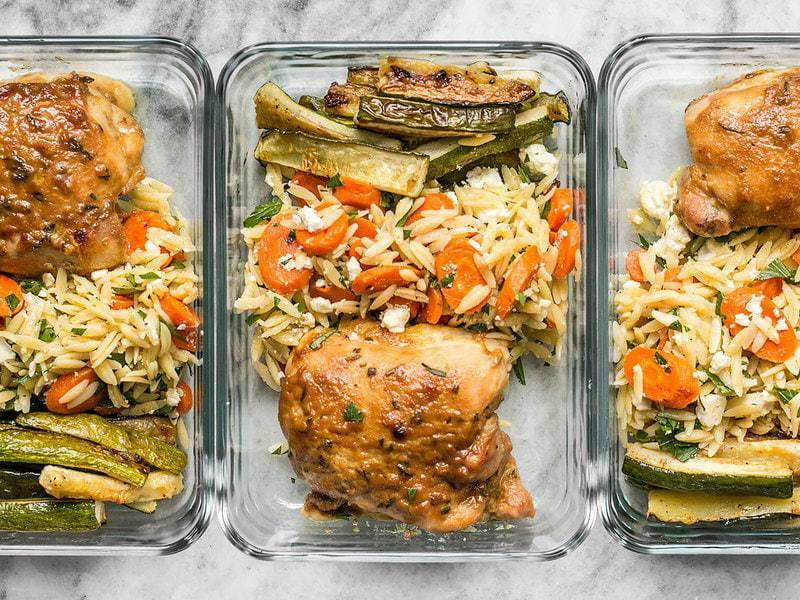 By the time the chicken was ready to go into the oven, the orzo was done so I poured that into a colander and let it drain while I attended to the chicken and carrots. There was still a few more minutes left for the carrots to roast, so the chicken sat for about 5-10 minutes until the carrots were done. Once the carrots were done, I took them out, and put the chicken in the oven in their place. Since the zucchini went into the oven later and have a higher moisture content than the carrots, they still needed a little more time in the oven. While the chicken and zucchini were roasting, I finished preparing the Carrot and Orzo Salad. Since the salad was finished before the zucchini and chicken were done, I popped that in the fridge for a bit. Finally all three items were finished, they went into their meal prep boxes, and into the fridge! Easy. It’s always good to go over all the recipes you’re preparing to get an idea of how you want to orchestrate their preparation. How much multi-tasking can you handle? What needs to be in the oven, at what temperature, and for how long? Make a mental map of how it will all go before you begin. Start the longest recipes first and the shortest recipes last. 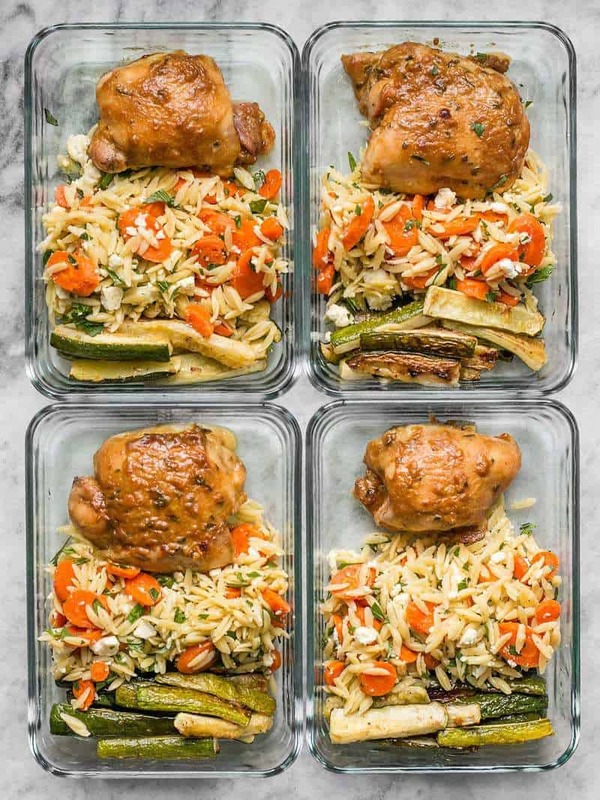 Both the Maple Dijon Chicken Thigh recipe and the Carrot and Orzo Salad recipe make around 6 servings, but you could certainly add a little more to each of your four lunch boxes to prevent having leftovers that go to waste. If you just redistribute the six servings to four, the cost of each of the four meals goes up to $3.42, which is still quite low for a meal compared to eating out. I don’t suggest freezing the orzo salad as I think it would get too dry during the freeze/thaw cycle. The Maple Dijon Chicken might freeze okay, although I haven’t tried freezing this one because I always eat it too fast! It’s super delish! I made this last night for my family and everyone loved it! The chicken was so flavorful and also easy!! I will 10000% be making this again! Does your recipes have serving size and calories fats and carbs. I didn’t see it listed. I made the orzo and chicken last night, Great recipes!!! I never thought about putting roasted carrots in orzo, but a great way to use them! Made this last night without the zucchini and everyone loved it! I have just enough for lunch today. Much appreciate your blog and recipes!! I’ve never roasted zucchini before–it looks like you sliced the zucchini (into quarters? ); then you just used salt and pepper (no oil?)? How long did you roast them for, and at what temperature–the same temp as recommended in the chicken recipe? I cut the zucchini into sticks, maybe 1/3-inch wide by 2-3 inches long? I just tossed them in a little oil with salt and pepper and then roasted them at the same temperature the oven was at for the chicken and carrots (375). I didn’t time it, I just kept and eye on them and took them out when they had some brown to them (I stirred them once after about 20 minutes). I would guess the total time was around 30-40 minutes, though. I have so appreciated your blog. The meal sizes are perfect for our family. My daughters(14,11) often use the meal prep for their school lunches. Can’t wait to try this set of receipes. I’m confused.. Isn’t the orzo salad something meant to be served cold and the chicken/zucchini meant to be served warm? How does that all work in one box? That said, I think I will try this one soon! I love roasted veggies as salad, and cold chicken is good with me, too–I saw this meal as something perfect right out of the fridge and that’s how I’m eating it right this minute at my desk.. Actually I make my husband kind of nuts because I consider room temp as perfect for most foods, excluding ice cream. Thanks, Beth, for more terrific lunch ideas–we had this hot for supper last night, leaving enough for 4 generous lunches. I roasted an onion and red bell pepper, sliced, with the zucchini, adding a little color and more flavor. The bell pepper was on sale last week for $.99, but the orzo salad and chicken both came in cheaper than your estimate so my bottom line was probably slightly lower. I’m making this tonight for dinners this week! Side of steamed broccoli and rice. This looks amazing, but just out of curiosity, why do so many meal preps (including the ones on this site) assume that I only want lunch four days a week? Is the assumption that I’m going to buy lunch one day? Does everyone else secretly only work four day weeks? Is the secret to telework once a week and just graze out of my fridge that day? Yummy. My mouth is watering right now!!! !